The Martin Yale 7000E Commercial Stack Cutter is a durable, precise paper cutter that has the capability to cut up to 200 sheets of paper at once. The 7000E Stack Cutter features a separate clamping feature and hardened steel blade for a perfect cut every time. With a cutting length of up to 12” wide and 1 ½ “ thick all standard letter size papers can be cut. The Martin Yale 7000E tabletop stack paper cutter is ideal for Tabletop cutter ideal for photo shops, schools, businesses, and small print shops. The heavy duty wooden base and non-skid feet offers optimum stability and longevity. The 7000E Cutter features a safety blade latch that prevents cutting until it is released and a positive clamp holds the stack of paper in place which eliminates shifting and tearing. The adjustable paper stop helps provide the most accurate cut, while the positive clamp firmly holds the stack in place, eliminating shifting and tearing. The 7000E Cutter weighs 45 lbs. and measures 19″ x 19″ x 13 1/8″to fit on almost any surface. If you have any questions or are interested in purchasing the 7000E Stack Cutter, visit us at SpiralBinding.com. 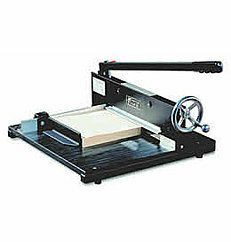 We have great pricing on a full line of Manual Paper Cutters. Call us at 1-800-631-3572 for more information.